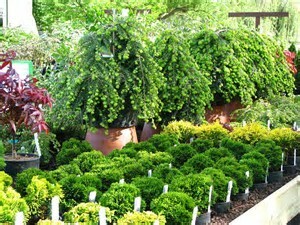 The popularity of dwarf and miniature gardens has taken a huge leap forward with the current passions for dwarf conifers and miniature hostas. But, how big is “dwarf” and how small is “miniature”? Contrary to logic, both dwarf and miniature refer only to the rate of growth, not the eventual size. A “miniature” conifer may get to 6 feet but if it took 30 years to get that tall, it’s still a miniature. 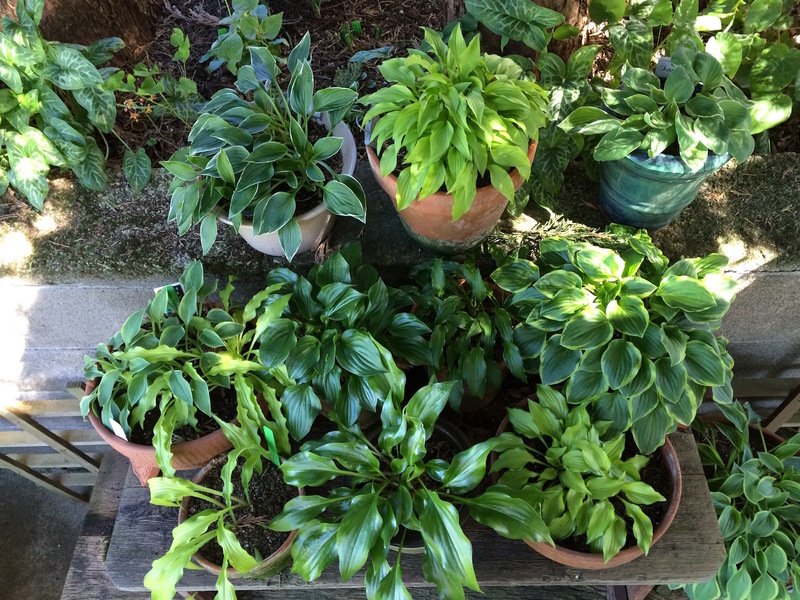 Hostas are miniatures when the leaf surface is less than 6 square inches…they can spread fast and be 10” tall, but as long as the leaf surface is less than 6” square it’s a miniature. So, slow growth and shallow containers limiting growth even further are the key ingredients in creating miniature gardens. Iseli Nursery in Portland has put together packages of dwarf conifers for local nurseries. They come in cute little round 4” pots and are easy to plant. Dwarf conifers are the true gems in tiny gardens. Putting together a small landscape is far easier, faster and arguably more satisfying than excavating another section from the lawn. Tools are few…a shallow container, a small trowel or a big spoon, some gritty soil (1 part coarse compost, 1 part medium to fine bark, 1 part coarse sand and 2 parts pea gravel), a few hardscapes (rocks and weathered wood) and the fun of buying and arranging a myriad of munchkin-sized plants. Conifers and hostas are not the only minis for the truly tiny gardens. Look for Bagatelle Barberry, Compacta Boxwood, Little Lottie Lavender, Tom Thumb Cotoneaster, Sky Pencil Holly, Little Heath Pieris, Lilliputian Epimedium and Duckfoot Ivy. It’s a whole new plant world when you get hooked on miniature gardens. Newbie South Sounders are usually shocked to find out that August and September are considered drought months in the greater Puget Sound. The torrents of steady rain that we got back in spring and early summer mean little to the healthy growth of newly planted shrubs, trees and perennials. The “water until established” warnings even on drought tolerant plants, is critical in August and September. Garden enthusiasm often wanes in late summer and the plants that “don’t make it through the winter” are often plants that were just short on water in the last few weeks of summer. Water deeply and thoroughly. These rainless days are critical watering days.